Rugelach are a traditional Hanukkah treat but, these days, they are eaten year-round. Typically, they are spread with apricot jam and filled with nuts and raisins, but dried cranberries add another festive touch. 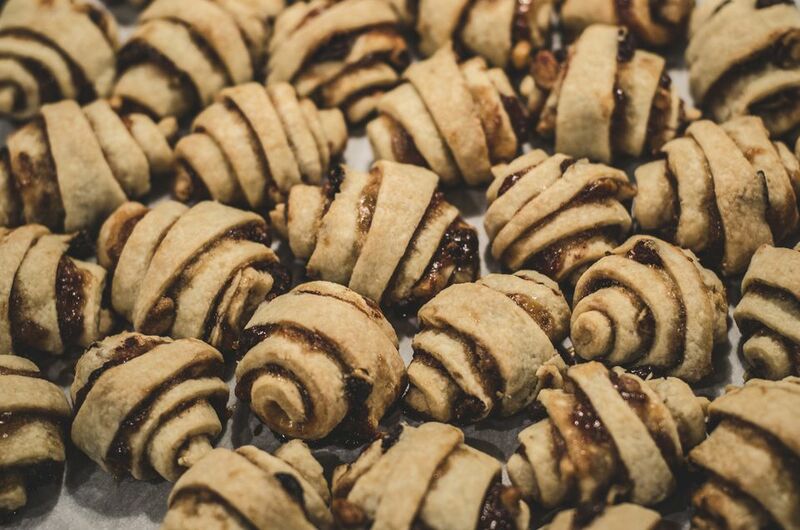 This recipe for Jewish rugelach is made with a cream cheese dough like Polish kołaczki, roszke ​or roski, and Hungarian kifli. Note: while there are multiple steps to this recipe, this rugelach is broken down into workable categories to help you better plan for preparation and cooking. In a large bowl or stand mixer, cream together the butter and cream cheese. Add the flour and salt all at once. Beat on low until the dough holds together. Divide the dough into 4 balls, wrap in plastic, and refrigerate for at least 4 hours. Place a rack in center of oven and heat to 350 F.
Warm 2/3 cup apricot preserves until spreadable. In a small bowl, whisk together the sugar and ground cinnamon. Set aside. On a lightly floured surface, roll out one ball of dough at a time into a 9-inch circle. Brush 1/4 of the warm apricot preserves over the entire circle and then sprinkle on about 2 tablespoons of walnuts, 1 tablespoon of the cinnamon-sugar mixture, and 2 tablespoons dried cranberries. Using a pizza cutter, cut each circle into 8 wedges. Roll each wedge from the wide side to the point. Place it on a parchment-lined baking sheet. Repeat with remaining dough. Make the topping. In a small bowl, whisk together the sugar with 1/8 teaspoon ground cinnamon. Brush the rugelach with beaten egg and sprinkle with cinnamon-sugar mixture. Bake for 25 minutes in center of oven until well browned. Immediately remove rugelach from baking pan to a wire rack to cool completely before serving. Rugelach are typically better the day after they are baked. Store the pastries in an airtight container for up to 2 weeks; they can also be frozen.